The best jazz albums of 2017 and the best reissues. Plus the best historical releases. 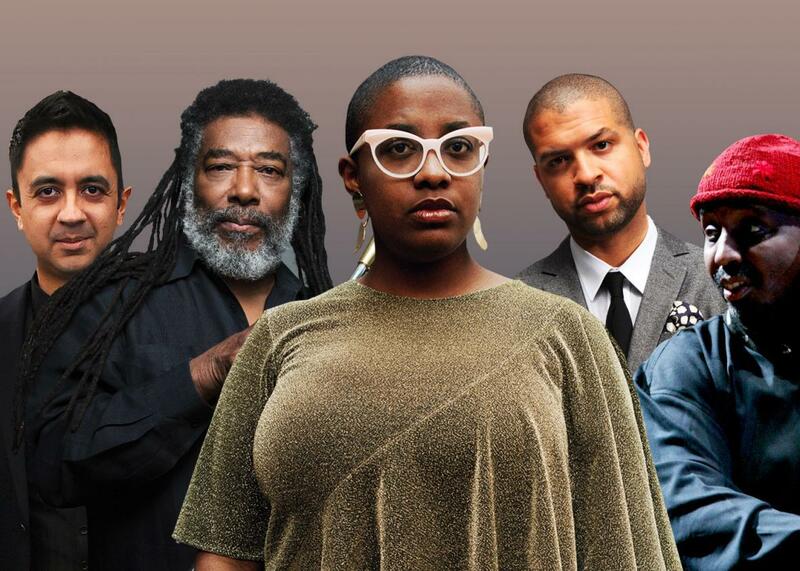 Among the favorites: Vijay Iyer, Wadada Leo Smith, Cécile McLorin Salvant, Jason Moran, and William Parker. Photo illustration by Slate. Photos by Ben Gabbe/Getty Images, Jimmy Katz, Mark Fitton, jasonmoran.com, williamparker.net. Even as the world goes up in smoke, artists still make art, and this very much includes jazz musicians, whose best work this year (at least the best that I managed to hear amid the noise) plumbed old and new, tradition and innovation, structure and freedom, with—under the circumstances—heroic strivings. I’ve been picking the best jazz albums of the year in Slate since 2002. Here’s my list (as usual, with audio clips included) for 2017. I’m firm on the order of the first four; the next six might be shuffled a bit, depending on my mood. In the past year or so, Cécile McLorin Salvant has evolved from a talented singer to a stunning master, and this double album—two hours of music, most of it recorded live at the Village Vanguard—catches her at the pivot. She sings standard ballads, buoyant show tunes, dirty blues, Kurt Weill operas, and more, stamping it all with a distinctive voice and a theatrical flair. She’s a storyteller, mining their lyrics for wit and drama that other singers, even great ones, glide by. It’s the best jazz vocal album in a decade, maybe longer. Oh, and she’s 28 years old. Jason Moran is the most inventive jazz pianist on the scene, and this is his most unusual album. The artist Julie Mehretu spent nearly a year painting two gigantic canvases in a converted church in Harlem (they’re now hanging at the San Francisco Museum of Modern Art); Moran dropped by now and then to compose music inspired by her swirls and strokes. Last spring, he brought in cornetist Graham Haynes and drummer Jamire Williams to improvise on the score and their own visions of Mehretu’s art, and this is the result—grand, intimate, stormy, and meditative, alternately or all at once. A remarkable boxed set documenting an Ornette Coleman–tribute concert at Brooklyn’s Prospect Park in 2014—featuring Geri Allen, David Murray, Henry Threadgill, Yoko Ono, John Zorn, Ravi Coltrane, and dozens more, including Coleman himself—as well as all the music played at a memorial concert shortly after he died a year later. It’s a mixed bag, as collections such as this tend to be, but much of it is as vibrant and thrilling as the occasions called for. Available as three CDs or as a deluxe set that also includes four LPs and two DVDs. Bassist-composer William Parker came up through the avant-garde and manages to fuse its innovations with crisp rhythms, deep blues, wit, and swing. This two-CD set was recorded in a single day with two different quartets, one fronted by a trumpet, the other by piano—the first more sprightly (even danceable), the other more adventurous, all of it accessible and alluring. This live album—a tribute to the late John Lewis, founder of the Modern Jazz Quartet—is Wynton Marsalis’ best in years. His arrangements are complex, lush, and swinging. Solos are packed with zest and sophistication from all the band’s sections, not least from the pianist on the date, Jon Batiste, whose playing spans far beyond the parishes of New Orleans. The alto saxophonist, composer, and impresario Steve Coleman has long been fascinated with patterns of motion in nature and how to capture them in music, melding rhythm, counterpoint, and harmony with a jagged swing in an original, head-popping way. Morphogenesis (a term that his liner notes define as “the process that causes an organism to develop its form”) is inspired by the movements of boxers. The band—an octet of alto sax, trumpet, tenor sax, clarinet, violin, piano, bass, and wordless vocalizing, with percussion added on some of the tracks—is as tight and limber as anything. It falls a bit short of his previous album, Synovial Joints (which ranked No. 2 on my list in 2015), but it still rivets and surprises. Here’s Jason Moran again, this time with his long-standing Bandwagon trio (Tarus Mateen on bass, Nasheet Waits on drums). For more than a decade, they’ve played all Thanksgiving week at the Village Vanguard. The album consists of selections from that week in 2016. It starts with a firebrand piano solo, segues into a roller-coaster ride through Moran’s “Gangsterism” theme (which he’s featured on many albums), sails into a lovely original ballad, batters the head with long rumbling, comes up for air with a Monk tune (Moran is one of two or three living pianists who can play Monk with Monk’s spirit but their own touch), and heads out with a reverie. I could do without the rumbling, but otherwise it captures the zest of being there. Vijay Iyer, a virtuosic pianist and theoretical physicist, once came off a bit schematic in his compositions and improvs, but those days have been over for years, and his new album, which expands his usual trio into a sextet (with horns), is positively ebullient, a couple of tracks stepping into soulful. The trumpeter-composer Dave Douglas teams up with the Westerlies, a versatile brass quartet (accompanied by drummer Anwar Marshall) to make music inspired by the American painter Stuart Davis, who was inspired by equal parts Cubism and swing jazz (“I like the explosive nature of Davis’ work,” Douglas says, “bright colors, big shapes, images bouncing off each other”), and somehow it works. The five horn parts (three trumpets, two trombones) bring out Douglas’ flair for harmonic hues. It’s almost like chamber jazz, but lively and brash. Trumpet solos of Thelonious Monk compositions may seem a dubious notion, but Wadada Leo Smith—an avant-garde pioneer, now 75—extends and bends his notes in a way that captures the feel of Monk’s jagged rhythms and fractured chords. This isn’t for everyone, but those who know and love Monk’s works will find it fascinating, at times enthralling. The year also saw the unearthing of great old recordings, never before released. In some cases, no one till now even knew they existed. Here are my five favorites. The pianist Bill Evans is often typed for his moody lyricism, but this 1968 session—the tapes only recently unearthed—finds him in buoyant spirits, his Ravelian harmonies opened up to full gallop. This was recorded five days after his Montreux concert, which was released as an album at the time and ranks among his best (just behind his 1961 Village Vanguard classics). Another Time features the same trio, including Jack DeJohnette on drums, and stands at the same level. This long-lost soundtrack to Roger Vadim’s film of the same title (spread out on two CDs, with alternate takes) isn’t the best Monk album from the period, but it’s not a mere novelty either. Monk’s piano work is drenched with playful energy, and the band—Charlie Rouse and Barney Wilen on tenor saxes, Sam Jones on bass, Art Taylor on drums—is in top form. * Bonus: The final track has Monk coaching Taylor through the drum part on “Light Blue,” a fine illustration of the complexities of Monk’s music and how it comes out when the musicians get it down. Another discovery by the audio archaeologists at Resonance Records, this 1966 live session with the great melodic jazz guitarist Wes Montgomery and the bluesy pianist Wynton Kelly—which also features bassist Ron McClure and drummer Jimmy Cobb (who’d played with Kelly in Miles Davis’ Kind of Blue sextet)—might have seemed a bit old hat in the context of its time, but we can now hear it as a sheer joy. In the late 1990s, Taj Mahal went on a 42-city tour with a gang of old, pure blues musicians. The producer, Tim Duffy, recorded several sessions on audiophile gear, but the tapes were stashed away, until a couple years ago, when the two took a listen, popped their eyes, and arranged with Chad Kassem, proprietor of Analogue Productions and owner of some of the world’s best vinyl pressing plants, to put it out on LP. The music is a thorough delight; the sound quality is you-are-there vivid. I’ve never been a big fan of Jaco Pastorius, the charismatic, self-destructive jazz-rock bass guitarist who died in 1987 at the age of 35, but this concert album of his 22-piece big band—recorded at Lincoln Center in 1982 as part of NPR’s Jazz Alive series—is a shocker. Rock-jazz fusion of the era was rarely this galvanizing, and the tracks where Toots Thielemans joins in on harmonica are breathtaking. Bonus: The original tapes have been remastered to sound much better than the original. Caveat: The two-CD set contains 40 minutes that have never been heard before, but there’s a reason for that—much of Disc 2 is a bit tired. Disc 1, on the other hand, is pretty awesome.